16 micron. El Nino x Sub-Zero lines! 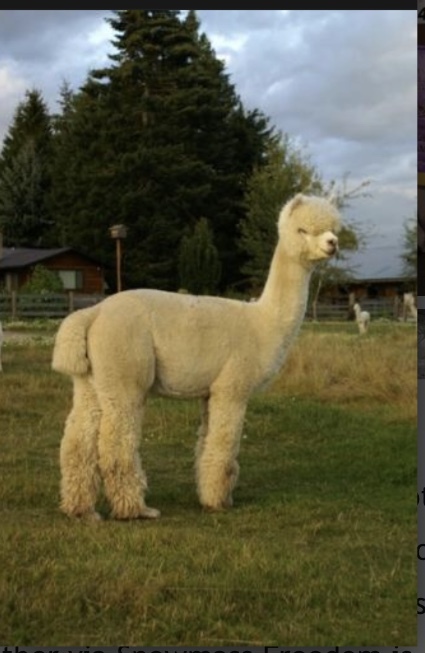 The Progeny from Snowmass Moondance are simply stunning and a REVOLUTION in the Alpaca breed in solidifying another powerful proven genetic line for elite alpaca genetics and fiber production like no other. Snowmass Moondance carries a bright pure white fleece with exception fineness character and density as was announced in his Champion win under 3 International judges at the International show 2011. MOONDANCE is a most handsome stud male which is essential in any breeding stud. He stands Proud and has strong straight correct frame with a gorgeous head. He has exceptional fiber coverage that perfectly wraps his body and when you open his fleece its a WOW! INCREDIBLE! Ish is a beautiful female and clearly is queen of the pasture. First and second shearing histograms are in the 18 micron range. We have achieved great things with this lady. Although, with her penchant for rolling in the nearest open dirt, we use the term "lady" with a bit of roll to our eye. This is a phenomenal deal. 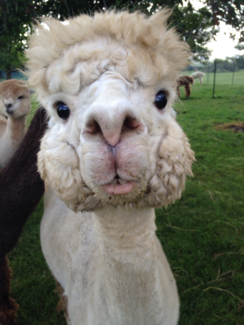 Not only do you get a fantastic alpaca, we offer a greatly reduced and fully transferable breeding. All purchases include transferable rights to a drive-by breeding to any of our wholly owned herdsires for only $250. Agisting available by arrangement. 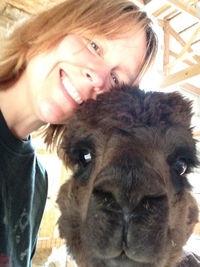 Bella took first place Bred and Owner light female at the Rail Splitter Alpaca show only 2 days over 6 months of age! The judge raved about her BRIGHT fleece and fantastic consistent crimp! 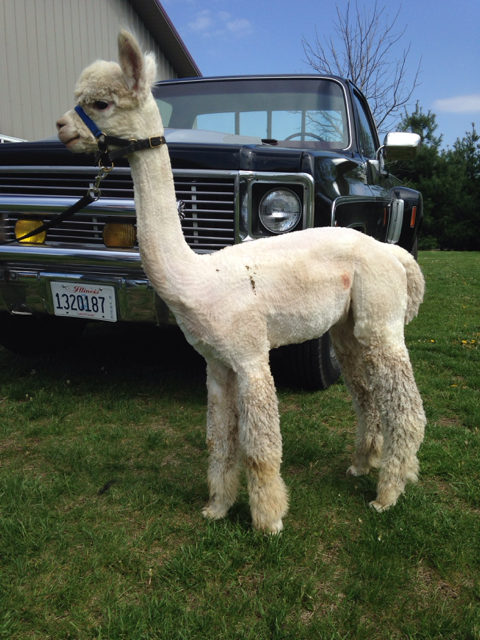 Her first shearing at 8 months produced a 16.3 micron AFD fleece with 100% comfort factor. WOW! We are looking forward to seeing how this young lady develops. Her dam, Ishsha is known for producing phenomenal cria with perfect conformation, fantastically fine fleece, and consistent blankets. This is no surprise given Ishsha's lineage. She is the product of a Mister Antonio daughter, bred to El Nino producing an outstanding female who was then bred to Don Quixote leading to Ishsha. Legendary champions at every level of her pedigree and took a blue ribbon herself at 7 years of age. Yes, the First Place white two year old male in the 2010 Futurity. 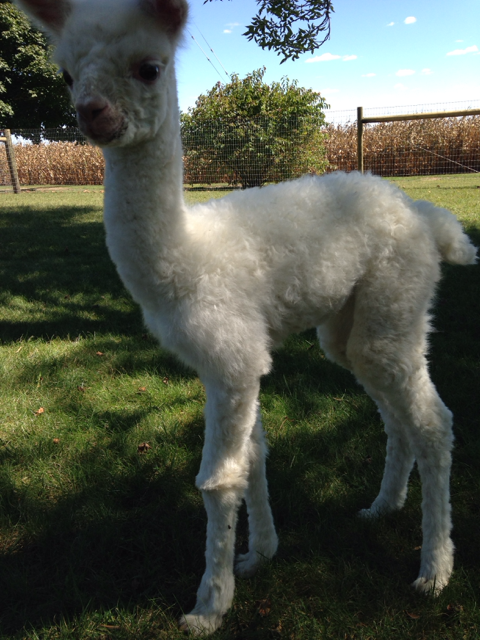 Moondance's Dam, Snowmass Freedom is one of the most valued white females that Snowmass Alpacas has produced. 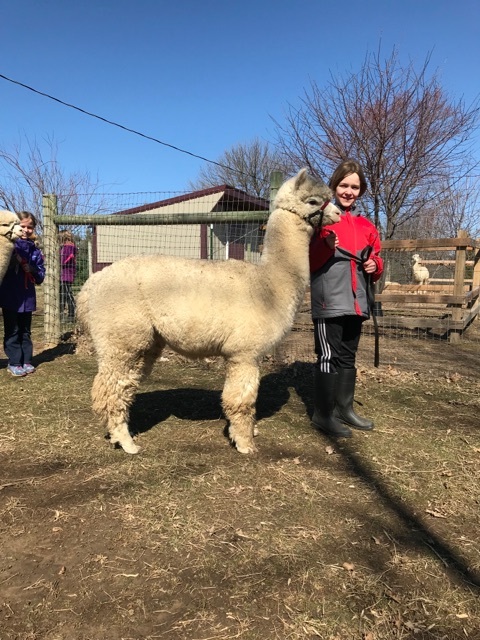 Bella is currently bred to Accoyo America Road Warrior for a spring 2019 cria. 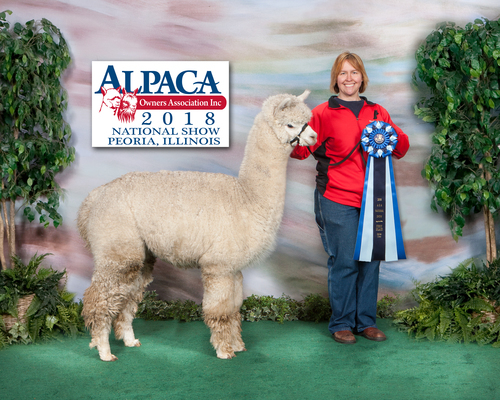 First Place, Light Bred and Owned female, Rail Splitter Alpaca Show, 2016. Judge Diana Timmerman.